With the start of New Year 2015, Ashampoo is now offering Ashampoo Burning Studio 2015 for a limited time. Ashampoo Burning Studio 2015 is the upgrade version of Ashampoo Burning Studio 2014, where is a CD, DVD and Blu-ray disc burning or writing software that delivers all the core disc burning functionality. Ashampoo Burning Studio 2015 provides simple and easy-to-use interface that features burn, backup, rip music, create audio CDs, and process all documents. 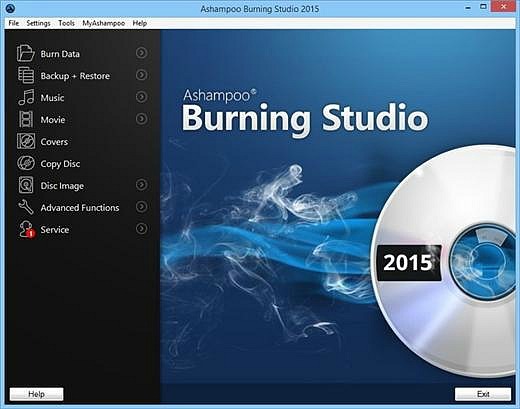 Ashampoo Burning Studio 2015 is normally priced at 39.95 per serial license key. Interest users can grab a full version copy for free. To grab the free serial license key code for Ashampoo Burning Studio 2015, just head to the Promo Page – enter the email address and click Request full version key button. An email with registration key for Ashampoo Burning Studio 2015 will be received. Enter the license key when running Ashampoo Burning Studio 2015 to convert the trial version into full version product, which can also be called from Help -> Register. Next, go to Ashampoo Burning Studio 2015 download page and then click “Free download” button in order to download the giveaway Ashampoo Burning Studio 2015 installer.